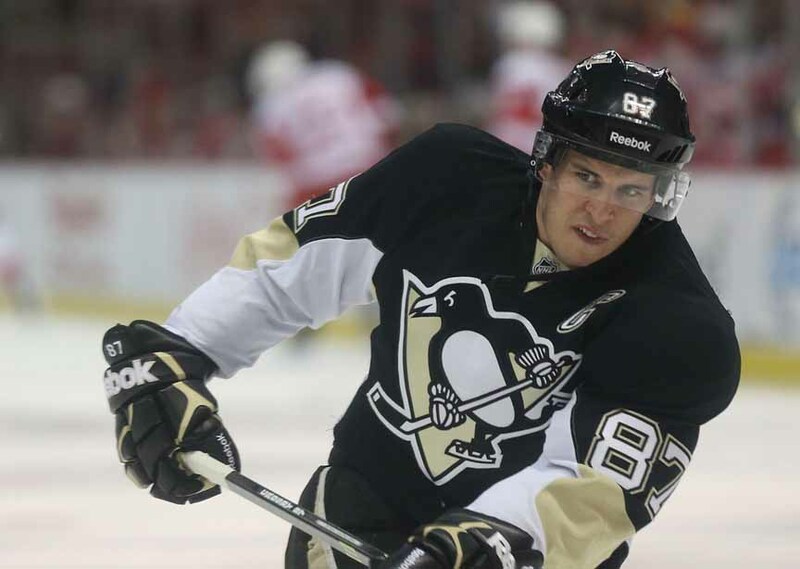 This home black air-knit gamer by Reebok was worn by Sidney Crosby during the 2013-14 NHL season. 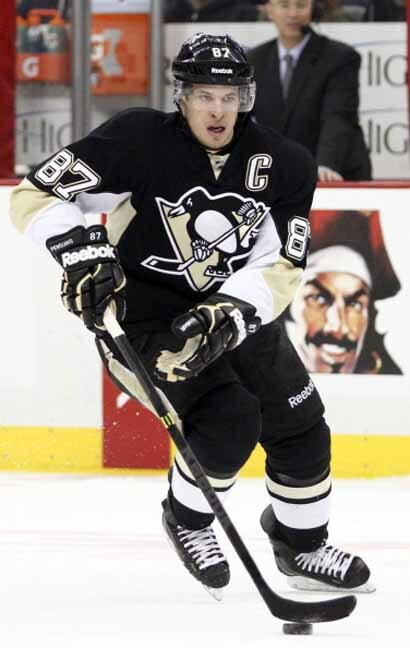 The Pittsburgh Penguins selected Crosby with the 1st overall pick in the 2005 NHL Entry Draft. Sidney joined the Penguins immediately thereafter and has taken the NHL by storm with his adept scoring and playmaking abilities. 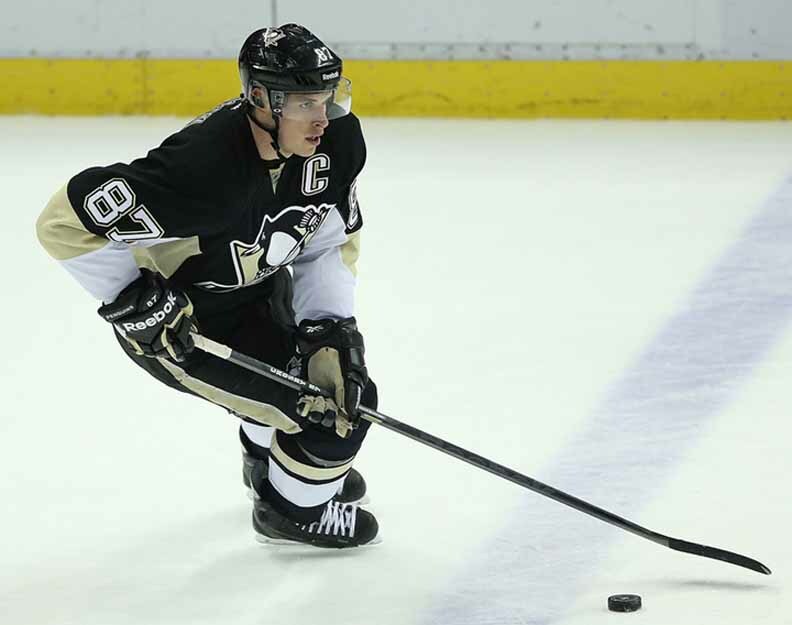 In just his 2nd season, Sid won the Art Ross Trophy as the leagues leading scorer, as well as both league MVP awards, the Hart Trophy and the Lester B. Pearson Trophy on the strength of a 120-point campaign. 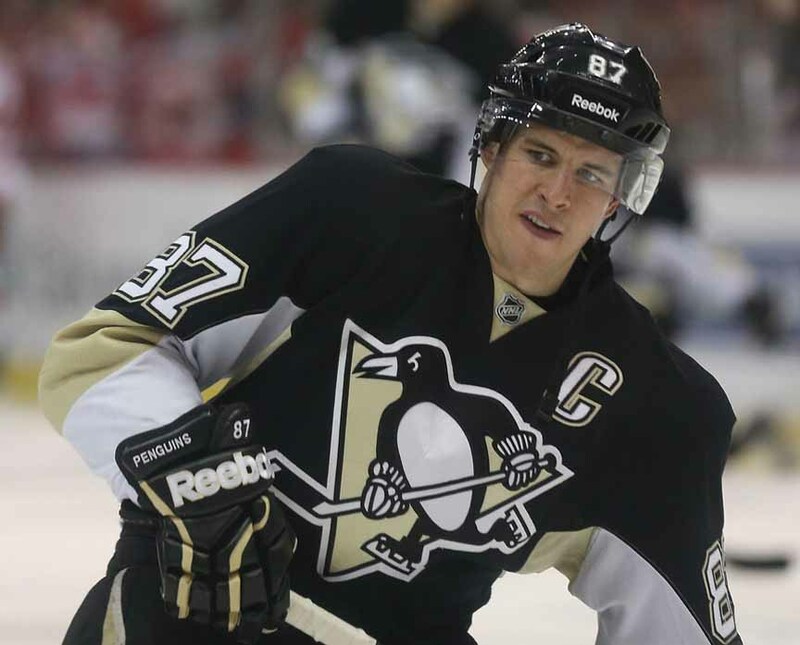 During his 3rd season, Crosby led his Penguins to the Stanley Cup Finals in what proved to be an unsuccessful bid for the Stanley Cup. 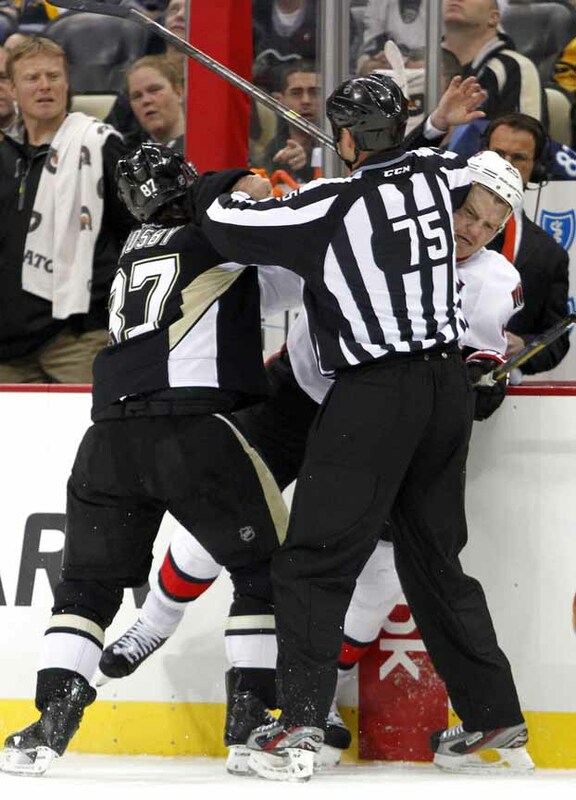 Revenge would come in year 4 as a Stanley Cup Finals rematch occurred between Pittsburgh and Detroit as the Penguins defeated the Red Wings for the greatest title in all of sports. 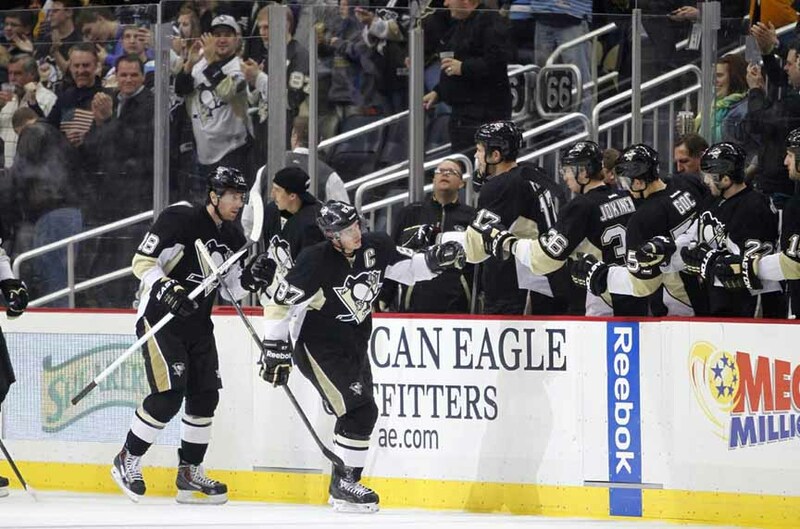 Crosby’s 31 points helped lead Pittsburgh to victory. 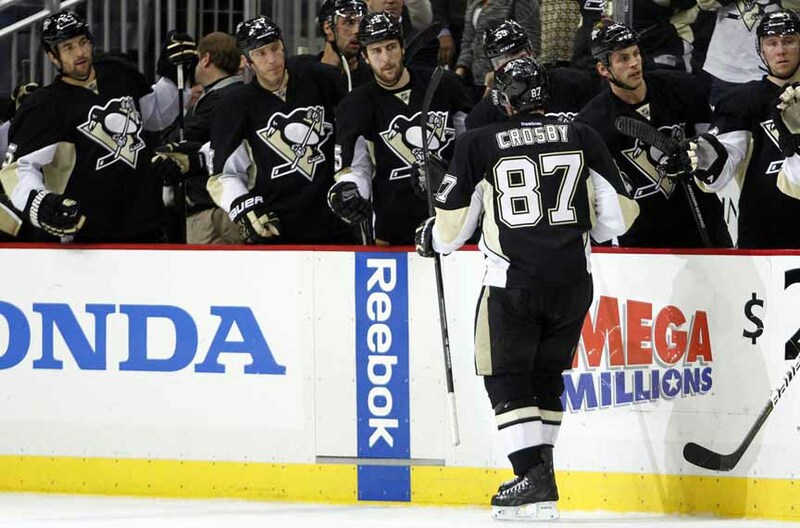 The 2009-10 season was another great one for Crosby. In perhaps the greatest international game of the modern era, Sid led Team Canada over Team USA to capture the Gold Medal with an overtime game winner to cap off a storybook ending to the 2010 Winter Olympics. 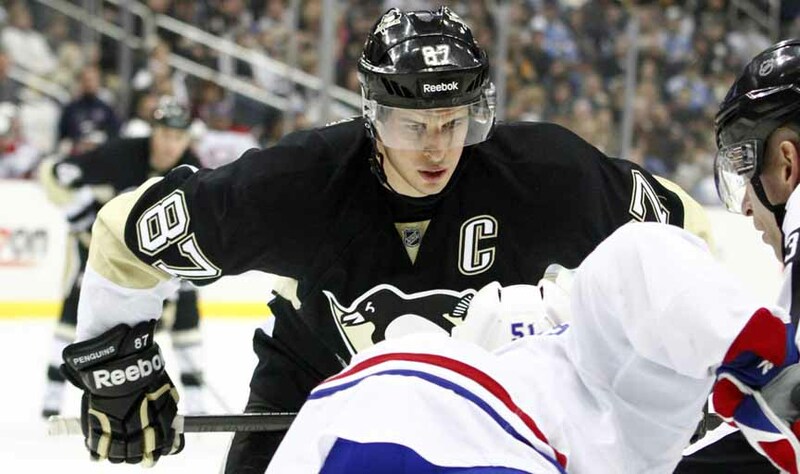 In addition, Crosby smashed his own personal high for goals in a season with 51, two of them coming on the seasons final day to tie for the Rocket Richard Trophy for most goals scored in the league. It marked the 4th 100-point season of his career. 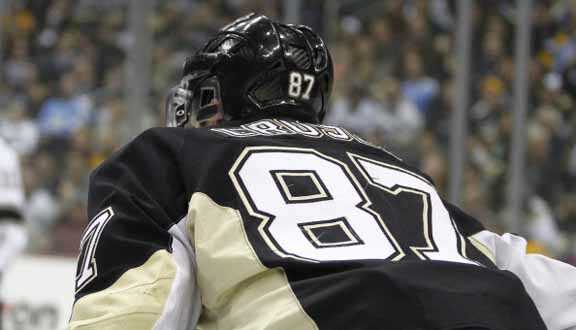 Midway thru the 2010-11 campaign, it looked as though Sid was going to shatter all of his personal scoring records. Thru exactly half a seasons worth of games he had scored 32 goals and registered 66 points before a concussion sent him to the sidelines, thus ending his year. 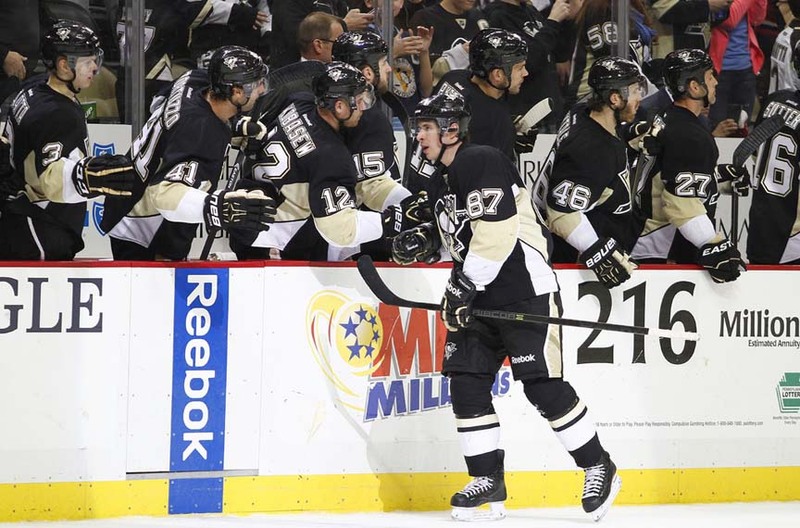 The 2011-12 campaign saw Crosby return to limited action while lighting up the score sheets with 37 points in 22 games played. 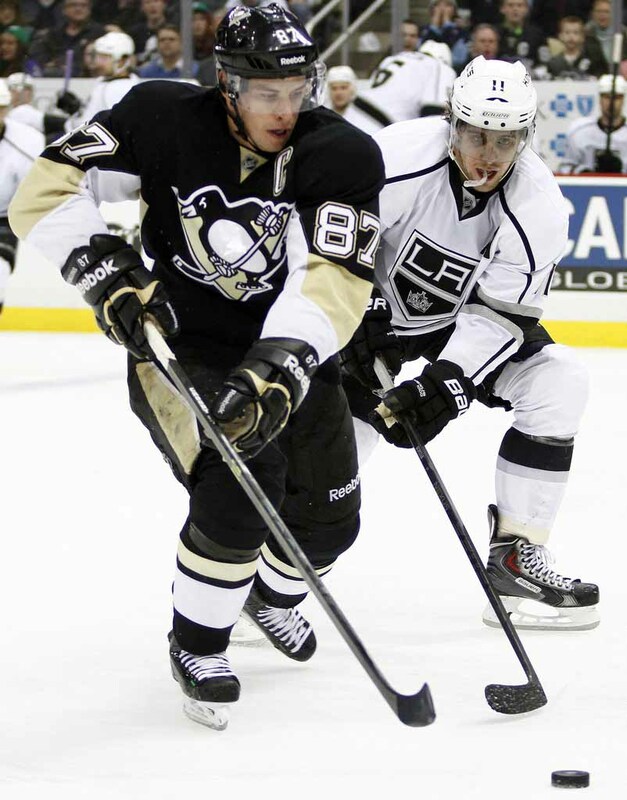 The strike shortened 2012-13 season saw Sid the Kid return to health and tally 56 points during his 36 game schedule. 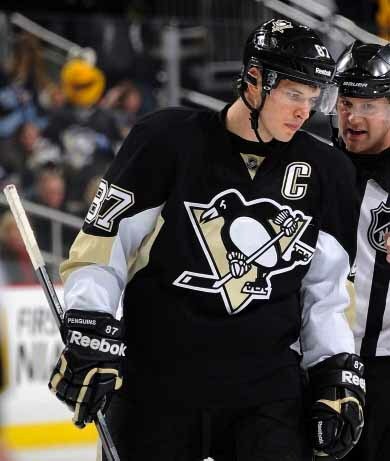 The 2013-14 season marked Crosby’s first return to a full NHL schedule since the devastating concussions that he suffered a few years ago. 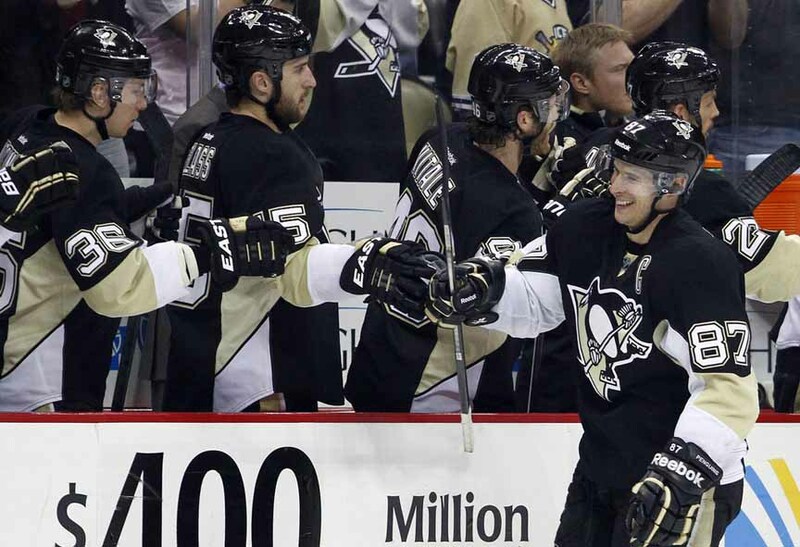 Sid ran away with the NHL’s scoring title on the strength of 104 points, earning himself his 2nd Art Ross Trophy. His stellar season also earned him his 2nd Hart Trophy as the NHL’s MVP, the Ted Lindsay Award as the NHL’s Most Outstanding Player and yet another 1st Team All Star selection. 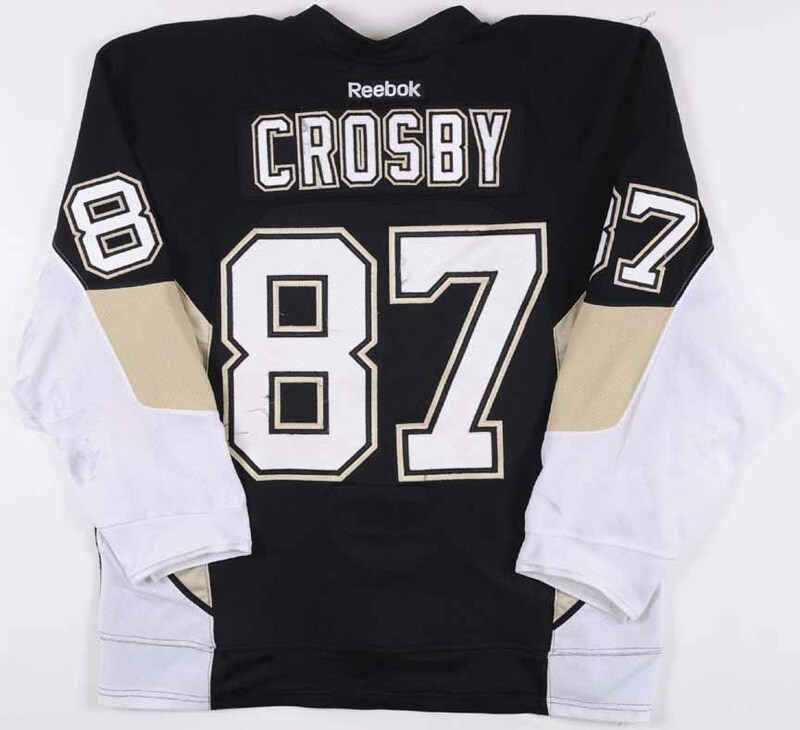 Crosby wore this incredible jersey during the entire 2nd half of the 2013-14 NHL season, a total of 21 games! Proudly sewn to the left breast of this gamer is the Captain’s “C”. The sleeves on this gamer have had custom wrist extensions added by the team. 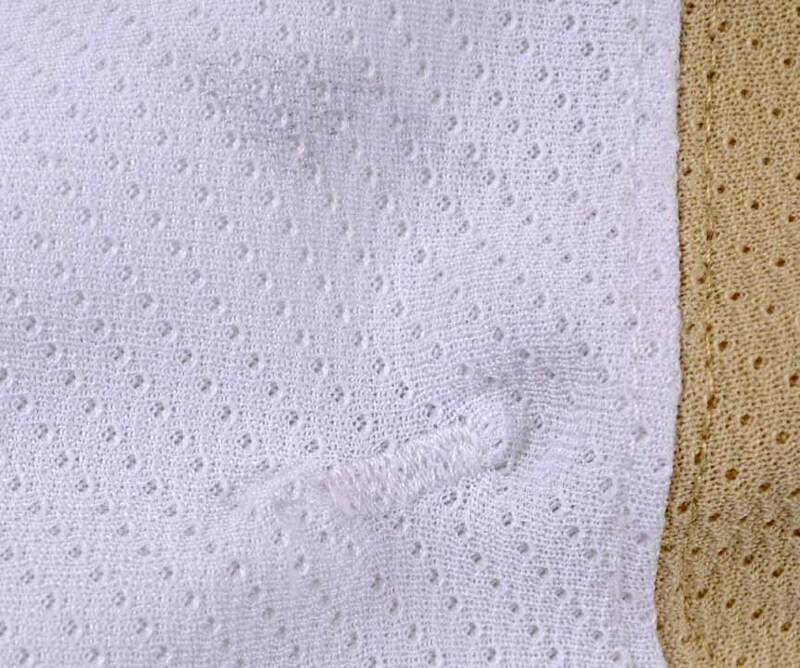 The game wear on this 2nd set size 56 sweater is solid and consists of numerous stick and slash marks, board burns, board paint transfer, loads of stitch pops and loose threads, heavy inner pilling and a team-sewn repair. 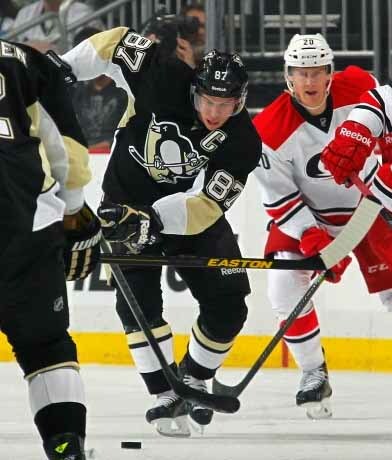 Shown above are more than two-dozen photo matches of Crosby wearing this exact jersey beginning with the January 3rd 2014 game against the New York Rangers and continuing on until the end of the regular season in April 2014. All of these photo-matched images will accompany your purchase and will be provided on a disc. Sewn to the inside hem is the official Pittsburgh Penguins game worn jersey and set tagging. A black sharpie signature by the teams equipment man resides on the inside fight strap. This gamer is housed with RFID technology and will be accompanied by the official game log that tracked its origins beginning on January 3rd 2014 all the way thru the April 12th 2014 contest. 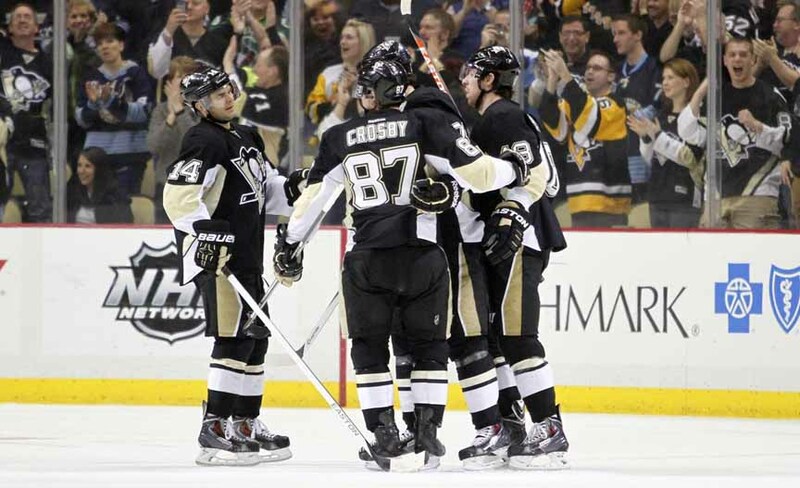 You will be hard pressed to find a Crosby jersey with better game use or documentation! This well-worn sweater features more than two-dozen photo matches and was donned during the entire 2nd half of the 2013-14 season as Sid earned himself double MVP, NHL scoring and 1st Team All Star honors, simply fantastic! 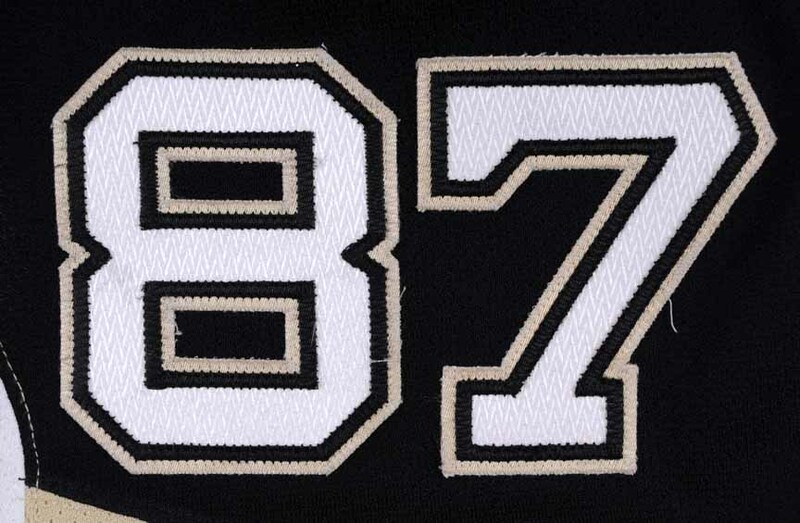 This jersey will be accompanied by a Penguins team letter.